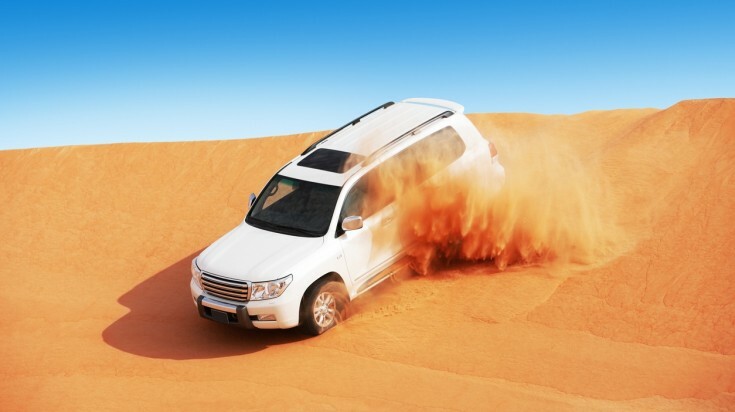 A desert safari is a great way to explore the Arabian Desert. 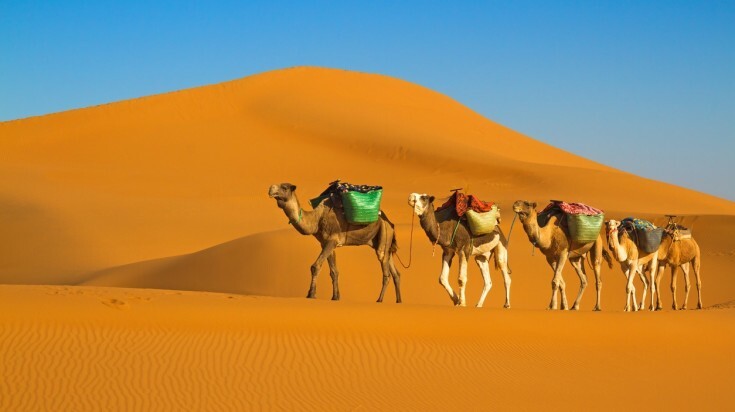 A desert safari in Dubai is a chance to experience the unforgettable landscape of the Arabian Peninsula and learn about the nomads who once inhabited it. While the highlight of the trip is undoubtedly seeing the vast, otherworldly desert, you’ll also have plenty of fun on dune drives and trying adventure sports like sandboarding. You may even catch a glimpse of rare native wildlife like the Arabian white oryx. It’s no wonder that desert safaris have become the number one thing to do in Dubai. Less than an hour from the futuristic skyscrapers of Dubai is the windblown Arabian desert. 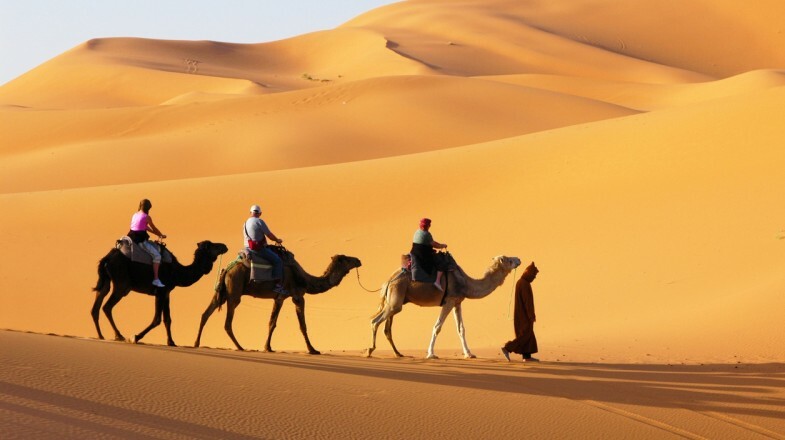 Desert safaris involve being taken to a specific area of this desert such as Al Awir, which is about thirty minutes’ drive from the city, or Al Lahbab, which is around 50 km from Dubai and boasts huge, 91-meter-high dunes. Slightly further away is the Dubai Desert Conservation Reserve, the first national park in the United Arab Emirates. Desert safaris are allowed here too — and the good news is that the entrance fee goes towards conservation efforts in the park, meaning you’ll be giving back while having fun. MORNING OR EVENING DESERT SAFARI? On a typical jeep safari in Dubai, there will be an itinerary of things to do ranging from fun desert sports to demonstrations of Arabic cooking, dancing or perhaps falconry, that give you a taste of nomadic life in the desert. Desert tour safaris will take place in the morning or evening. Both morning and evening trips can be tailored to include anything from Arabic bread-making to Saluki dog racing and even hot air ballooning. As well as being the coolest times of the day, these are also the most magical times in the desert; the low sun creates extraordinary light that turns the sand coral and rose-pink. On a typical morning safari, you might stop for a camel ride, try sandboarding and dune-bashing, take photos and spend some time spotting gazelles and Arabian oryx. Morning desert safaris are perfect if you are short on time. Most morning desert safaris start from 9 am and last 2 to 3.5 hours, allowing you extra time for other activities later in the afternoon. It is also a more quiet time to go as most safaris take place in the evenings. A typical evening safari involves driving to a Bedouin-style camp, watching a mesmerizing dance show, star-gazing, trying henna painting and enjoying some Middle Eastern cuisine. Evening desert safaris usually start at 3 or 4 pm and provide a chance to see the stunning sunset in the desert. Some even offer the option of staying overnight in the desert. One event your Dubai desert tour is almost guaranteed to include is a bumpy ride on a camel. If you are worried about using an animal for fun — don’t be. In the Middle East, camels are considered valuable, and camel racing and breeding are both popular pastimes. Some tours make a point of highlighting how well their camels are treated and may offer to take you to a camel farm, where you can see how the animals are looked after and bred. Thrill seekers will want to add "dune-bashing" to their safari itinerary. 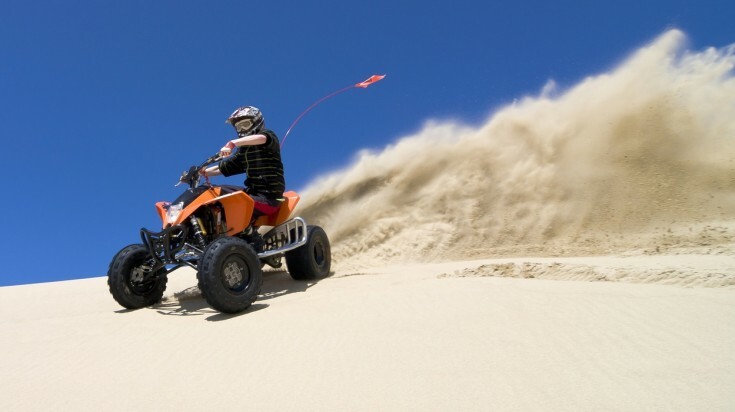 Basically a joyride on the sand, dune-bashing involves hurtling up, down and along the crescent-shaped dunes in a customized four-wheel drive vehicle. The experience is not for the faint-of-heart. Make sure to book with a reputable tour company, wear a seatbelt and don’t take young children or babies — they won’t be allowed. For ecological reasons, some companies refuse to offer dune-bashing altogether and, instead, replace it with "dune driving", which, they argue, doesn’t damage the desert’s fragile ecosystem. Like the sound of racing around the dunes? You might also want to add sandboarding to your safari schedule. Combining elements of snowboarding, skating and surfing, sandboarding involves sliding down dunes as high as hills on a wooden sandboard. Although it isn’t easy, it is one sport you can only try in the desert — and you will have plenty of laughs trying to stay upright. Some safari activities, like quad biking, need to be pre-booked. Quad biking is a fun way to get away from the crowds and into the desert proper. Anyone can try it, your guide will make sure you stay safe. You will get a sense of how vast the desert is, as well as enjoying a unique sense of freedom as you ride around without any road signs. 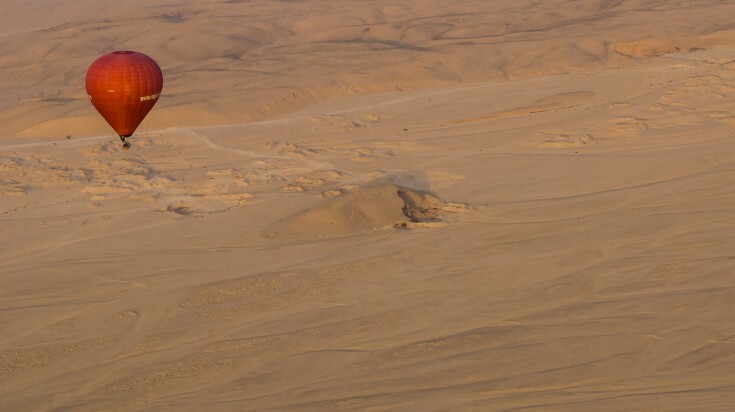 Go on a hot air balloon ride and enjoy the stunning desert landscape. Hop on a hot air balloon and glide above the desert. Taking a hot air balloon ride is a calm alternative to the many active activities that you can do on a desert safari in Dubai. A hot air balloon ride typically lasts for an hour. Catch the sunrise in the desert, spot wildlife or oases and marvel at the landscape as you get a new perspective on the vast Arabian deserts in your tour. While you don’t need any special clothing or equipment to enjoy a desert trip in Dubai, there are a few things to bear in mind. Plan what you want to do in advance. Do you want to spend time photographing the ripple-marked dunes, or would you rather be tearing down them in a Jeep? Make sure you are fit enough. Will you be able to walk up a dune to see the view? Wear sensible clothing. Do you have practical shoes and warm clothing in case it gets cold at night? Check the alcohol situation. Alcohol usually costs extra, and there won’t be any if your trip takes place the night before a religious festival such as Ramadan. Perhaps the most useful thing to know when booking a desert safari in Dubai is that you definitely get what you pay for. If you opt for a budget trip (around USD 40–45 per person), you will be in a shared camp with other tour groups close to the city. You’ll get a flavour of the desert, but that’s about it. Spend around USD 115–130* per person, and you will enjoy all kinds of perks, from door-to-door service to being welcomed with Arabic coffee, rose water and dates, or watching Yola — a dance and poetry recital performed by Emirati men. Opt for a bespoke or luxury safari, and you can expect something truly unique, where you will gain a real understanding of how nomadic people survived in the ever-changing desert.